March just doesn’t bring madness on the court, but there’s retail insanity during the month. Fans grow increasingly more and more rabid as their favorite teams progress throughout the tournament. Here’s our 25 of our favorite March Madness gear that we’ve come across in the 2019 tournament season. The list includes everything from t-shirts to sweatshirts, shoes to jerseys. Get these fresh (literally and figuratively) Sweet 16 tees and show your strong loyalty. These sweet sweet shirts are made of 100% cotton and officially licensed by the NCAA and branded by Fanatics. 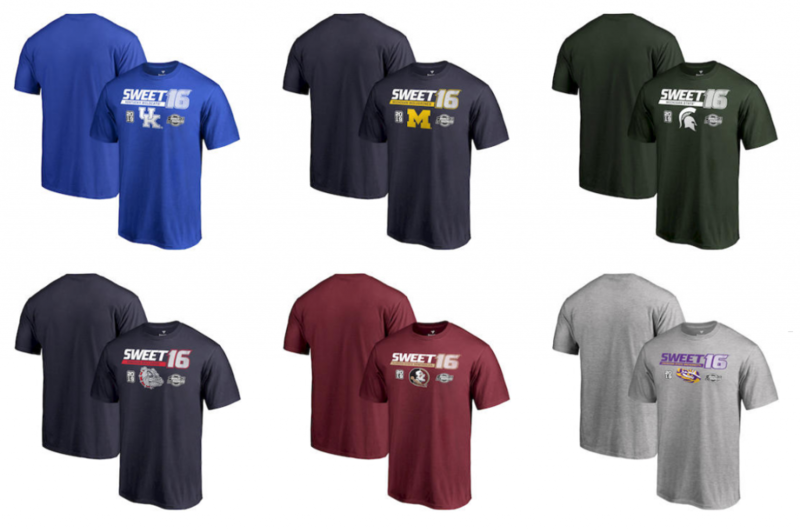 To find your team and buy one of these Sweet 16 t-shirts, go to Fanatics site here. These March Madness t-shirts are HOT. NCAA fans really have been buying up the white long-sleeve March Madness t-shirt below. If you like, you should jump on it sooner than later. Take a look at these special event t-shirts from exclusively from Fanatics. These Fanatics-branded 2019 NCAA Men’s Basketball Tournament March Madness 68-Team T-Shirt comes in either long sleeve or short sleeve and in two primary colors: Heather Charcoal and White. Made of soft cotton, you can support the college tournament in comfort. Be the first of your friends to get one of these tees — go here if you’re interested in buying one of these great tees. Also use code SHIP24 for free shipping! 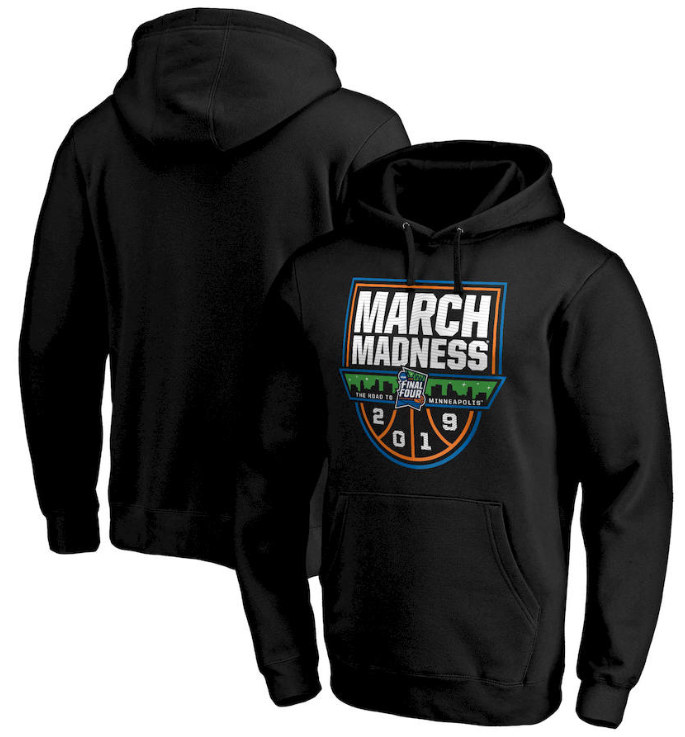 You’re cool, so make it hot with this officially-licensed NCAA March Madness pullover hoodie sweatshirt in black to warm it up for March Madness 2019. 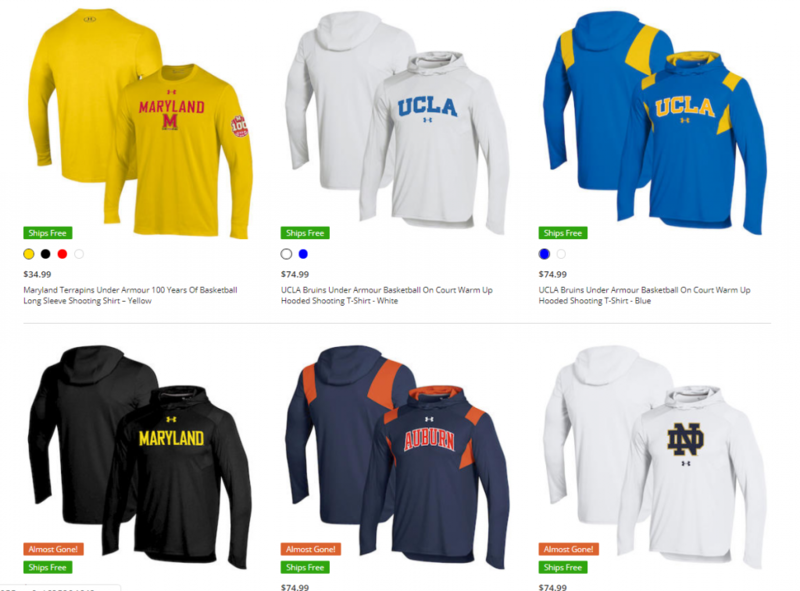 Sweatshirts are one of the best-selling merchandise for the NCAA — can be worn by anyone, anywhere. This black hooded sweatshirt is made of 80% Cotton and 20% Polyester for a nice light feel but it’ll keep you warm for sure. 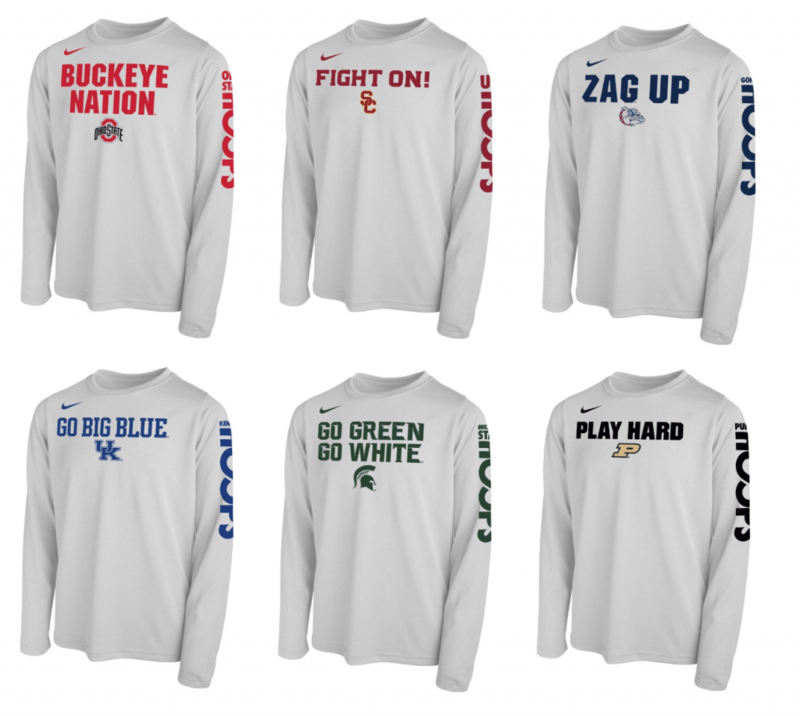 It’s exclusively branded by Fanatics features colorful and crisp screen-printed graphics that’ll make it your go-to sweatshirt throughout the March Madness and after. Buy the sweatshirt here. There’s no better way to support and cheer for your team than with these special March Madness Team Slogan t-shirts NCAA Men’s Basketball Tournament — from Nike, these March Madness Bench Long Sleeve Performance T-Shirts are hugely popular and many are almost sold out. 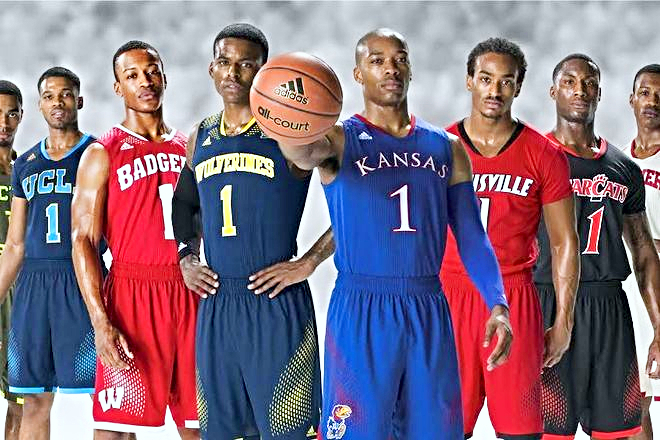 Is your child is a loyal fan to their college program or their favorite March Madness team? Then one thing always has to happen, they’ve got to rock the best team gear on game days. This is especially true during March Madness. Pick them up this 2019 NCAA Men’s Basketball Tournament Bench Dri-FIT T-shirt from Nike so he can put forth their fandom for everyone to witness with the best game day style. Fresh graphics accompany the team’s slogan and will make this your youngster’s go-to tee for cheering their team for the win. To see all the options and all the teams, check this page out. 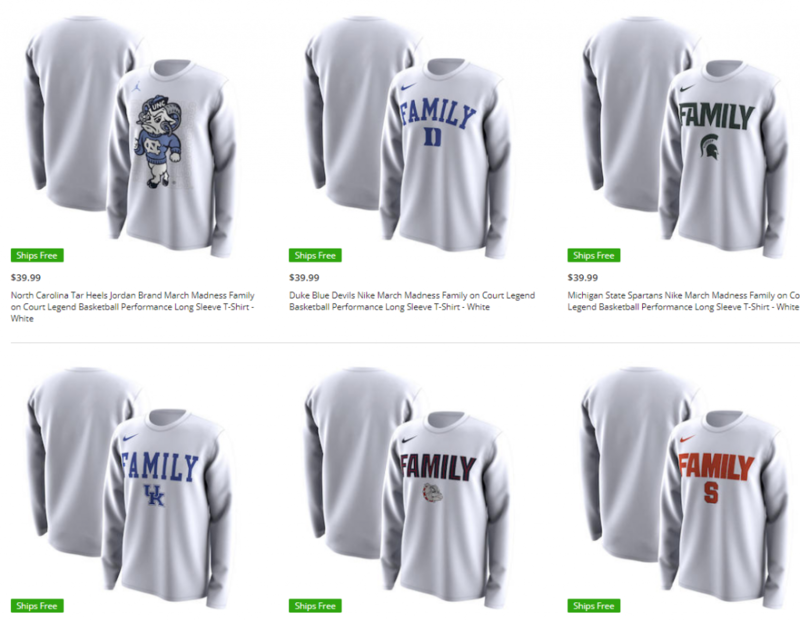 Take a break from the bracket madness and do a little retail therapy with these “FAMILY” branded and logo long sleeve shirts. First check out these Jordan Brand March Madness “Family” logo shirts and sweatshirts that you’ve see on the court all throughout the tournament. Shown above is Duke Blue Devils, North Carolina Tarheels, Michigan State Spartans, Kentucky Wildcats, Syracuse Orangemen and Gonzaga Bulldogs. To check out all the “FAMILY” options on these basketball performance long sleeve t-shirts, click here. Related: What do the Nike Family shirts mean? As a huge college basketball fan, you want to be on top of the latest (especially for your team) so you don’t ever want to miss out on the March Madness action. You pride yourself on being on top of the tournament, so get this 2019 NCAA basketball tournament Sweet 16 shirt to center your fandom right onto your chest. Then we have these awesome “BIG DANCE” t-shirts created for every March Madness team. These are officially Fanatics-branded March Madness Big Dance T-Shirt made for the 2019 NCAA Men’s Basketball Tournament. Pictured are Texas Tech, St. Louis Billikens, Clemson Tigers, Mississippi State Bulldogs, Ole Miss Rebels and the Syracuse Orange. 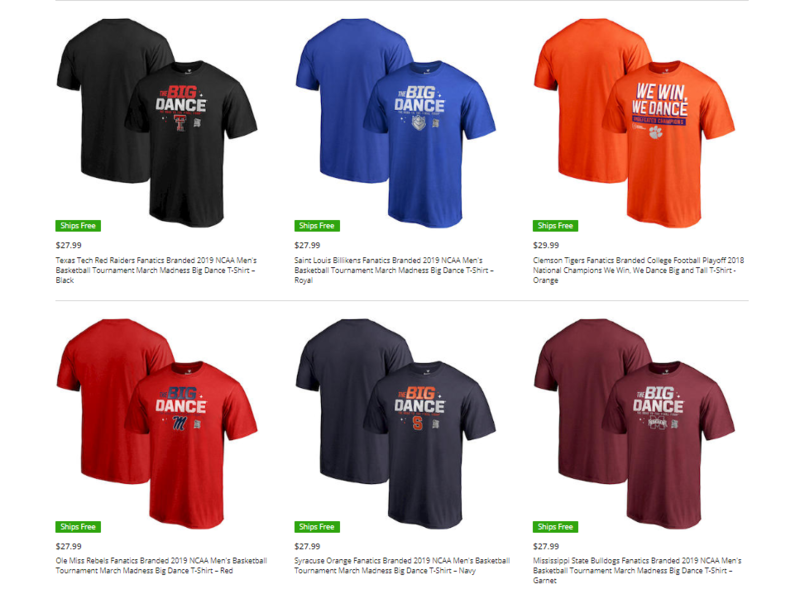 Want some of these dope “BIG DANCE” t-shirts for your favorite college program? click here. We were searching on shooting shirts for March Madness earlier today and came across these hooded shooting shirts that rep a bunch of the big and small name colleges. These are officially called On-Court Warm Up Hooded Shooting T-Shirt by Under Armour Basketball. We think these are fresh and clean. If you’re interested in these hooded shooting long sleeve t-shirts for your Alma Mater or college team you support, college program? go here. And there’s nothing like putting on your university’s jersey in support of the team, whether they’re in the NCAA March Madness tournament or playing in the NIT. These come in both authentic or replica, Nike or not. 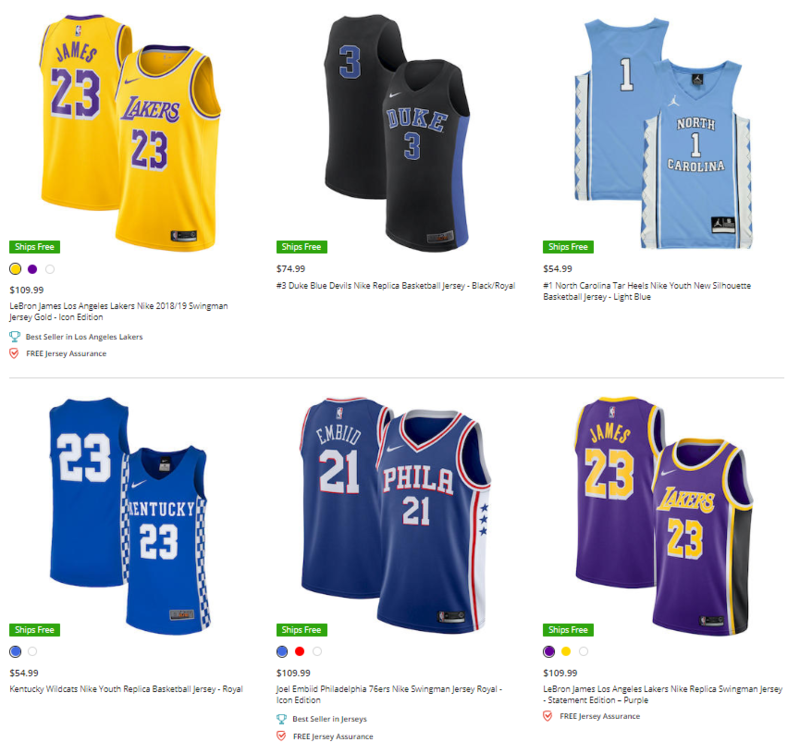 Support the Duke Blue Devils with these jerseys, or check out some other Duke gear in this post (like they need more fans), the Kentucky Wildcats, the Michigan Wolverines, North Carolina, Texas Tech and more. 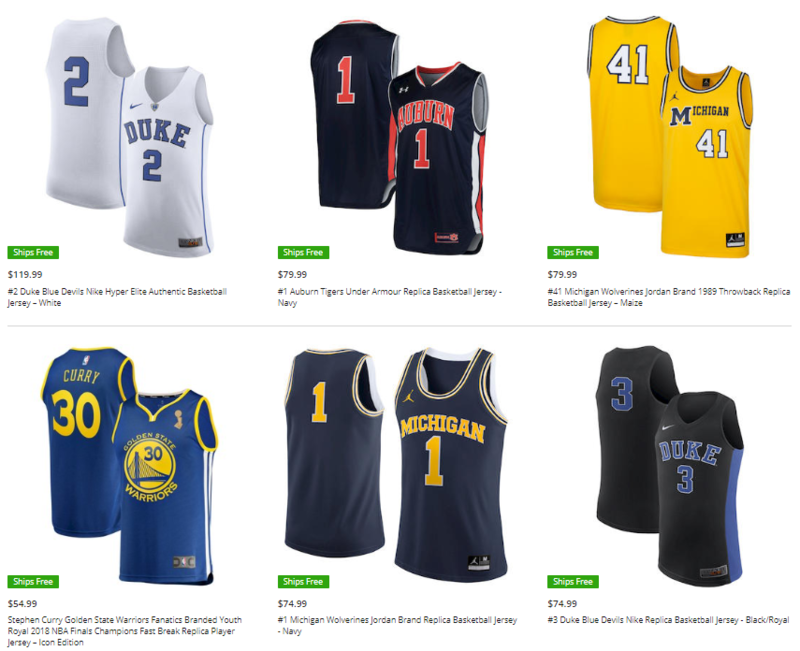 Peruse the college jerseys for the tournament here. 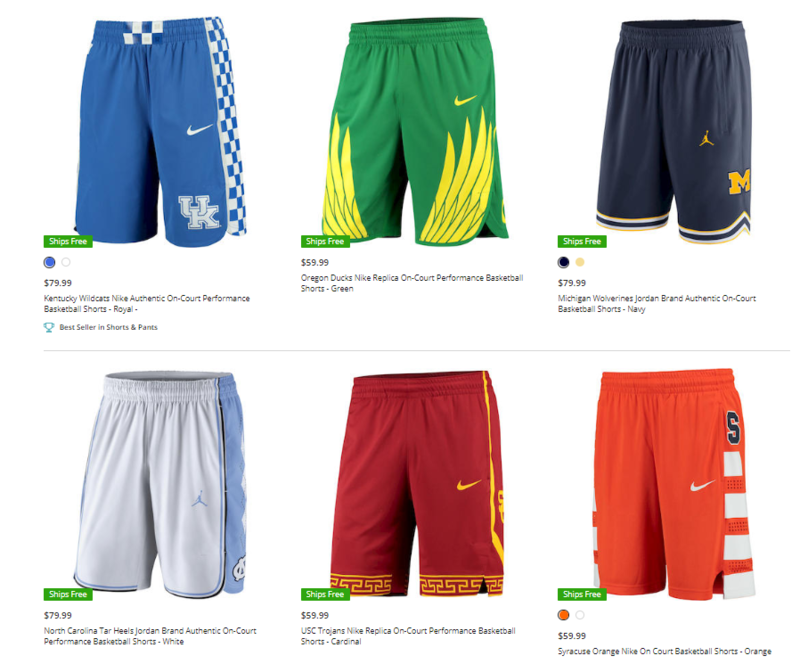 Now that you have a jersey top, complete your fan look with these official, authentic, or replica on-court performance shorts sporting the colors and logos of your favorite college program during March Madness. If you’re searching on the brand of these, they’re referred to as On-Court Performance Basketball Shorts either created by Nike or Jordan Brand. They come in all sizes and lengths. Pictured above are the Kentucky Wildcats, Oregon Ducks, Michigan Wolverines, North Carolina Tar Heels, USC Trojans, and the Syracuse Orangemen. If you want a pair or two (home and away, anyone) these college basketball shorts can be yours for on the court playing or off-the-court support of your favorite team. 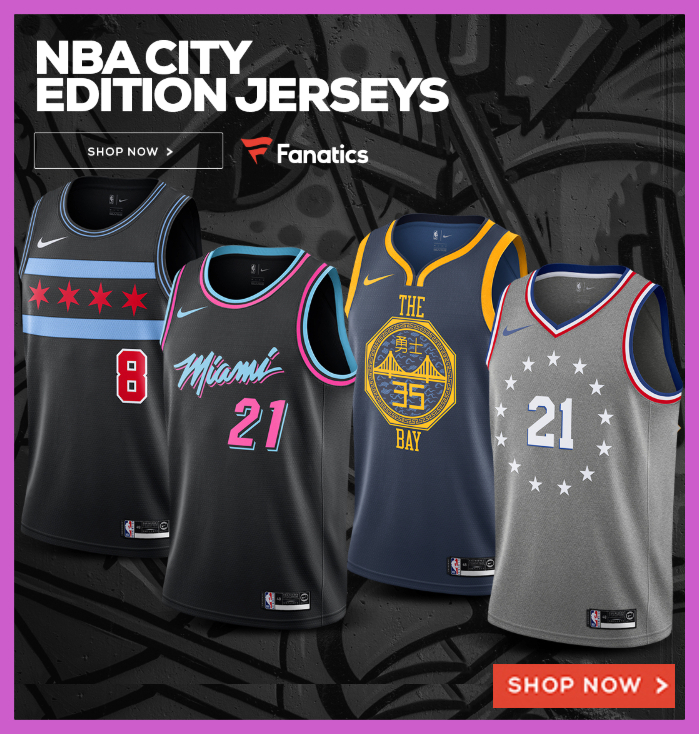 In any case, check them all the basketball shorts at Fanatics.